Traditionally sourdough bread was prepared with a starter rather than with yeast. This makes the bread more digestible due to the type of fermentation that results in using a starter. The fermentation greatly reduces the phytic acid in the wheat allowing our bodies to extract the maximum amount of nutrients from it. First, we need to create a sourdough starter. This will give us our yeast and bacteria that will make our bread rise. The basic idea is to mix the same amount of water to whole wheat flour together and let it sit on your counter for about 12 hours to ferment. Then repeat the same process over and over again until the starter is very bubbly and well established. It may take up to one month for a starter to be ready to use for making bread. 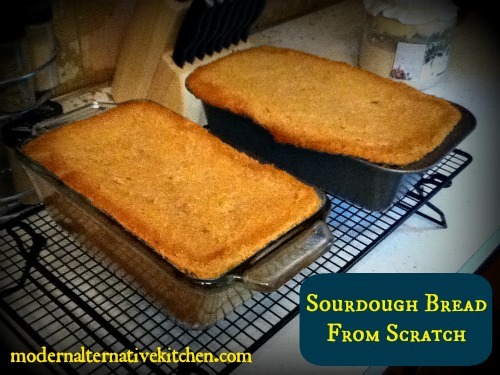 To read more of this post and for a sourdough bread recipe visit Modern Alternative Kitchen.